Favourite Fatal Frame characters: Literally all of the final boss ghosts, but especial shoutouts to Sae and Sakuya as my absolute 'if I had to choose' favorites. Misaki, Ruka, Yuuri, Rei. Kageri and Watashi. Rei. Likes: I thoroughly enjoy creepiness and horror of mostly a psychological variety, making things not as they seem, exploring the settings and backstories of the different games (from, say, the time the ghosts were around, etc. ), complex plot twists... and I guess lots of fluff, if I have to. I have a special weakness for people falling asleep on each other. Other interests: I am so deep into Persona Hell it's not even funny, save me. Also I have a general love of horror and fantasy in general, plus a lot of Japanese folklore, and things tangent to that (i.e. Touhou Project. Someone write Yuyuko booping one of the protags on the nose). I play a lot of Overwatch. Being a writer myself, my pairing interests up there are pretty standard, but I also will happily challenge other writers/creators who are looking for a different kind of challenge in their writing/art and want to do something possibly more disturbing, weird, or out of left field. So I am totally up for exploring different kinds of character dynamics; a Misaki/Ayako hatemance, for instance. Or perhaps a Sae/Mio dynamic that comes out of Mio accidentally exorcising Mayu's spirit out of her own body and leaving Sae in full possession, who then goes full insane Yandere against Mio, because Mio is still partially in possession of Yae's lingering regrets. Pairing up some of the final boss ghosts for s&gs... I don't care, but if you have something out of the ordinary you wanna write/draw/do, throw it at me. Sometimes those are the best stories to read/things to experience, because the creator is more invested in them, even if they're not something I'm personally invested in. Or someone can write Fatal Frame Go. Merry Christmas Rezz! and Happy New Year! I hope it quenches your Sakuya/Misaki thirst a bit. “Do you believe in love?” the question comes from the lips of Marie, sitting with her back against the side of the bed in Ruka’s upstairs bedroom. Four other girls sit in various positions around the central table of the room, and they all fall quiet in pondering. Marie has always been the true dreamer of the group, and everyone else knows it. She enjoys romance novels, and cliché shoujo manga, where the hapless but surprisingly powerful heroine finds her destiny intertwined with the young male lead, sometimes even with a literal red string of fate tied about their fingers, and along their journey of self-discovery they find the meaning of life and love and blah blah vomit. Misaki can’t roll her eyes hard enough at the question. ‘Love’ is not really something she describes without a touch of disdain to her voice, without an air of scorn for the entire concept. At least, when it comes to romantic love. Romantic love is a thing of the imagination, a childish concept for childish individuals, a folly to believe in from the start that means nothing but doom or stupidity for those it drags under. Perhaps she’s being a bit dramatic with the internal tirade, but at the end of the day, Misaki holds a certain amount of contempt for the idea. She loves her friends, and she loves her family, but a level of involvement beyond simply platonic is beyond her aspirations. No, if anything, it would be an obstacle. And so her only answer to Marie’s question is the eye-roll, and the room erupts into gossip without her joining. Madoka is enamored with the idea of it, at the very least, and as soon as she starts into the topic, it’s like a broken dam that slowly crumbles under the flood of water. Tomoe agrees, but holds a more old-fashioned ideal of romance and slow, sweeping drama, and Ruka, Misaki notices, says nothing, merely staring with a sort of distant, lost expression, green eyes dull at one of the pictures hanging on her wall. Well, Ruka may not share her derision for the topic, but at least Misaki feels a type of solidarity in Ruka’s refusal to say much of anything at all. Some part of Misaki, however, drowned deep within her, beneath the crushing pressure of a night time sea isn’t sure. The shattered remains of a part of herself she long thought gone stir and grind in the murky depths, but it’s absurd. Misaki has never been in love, and never, she thinks, wants to be in love. Besides, she’s not even a full person. There’s too much missing, there’s too much broken, there’s too much that just wants to fall into the oblivion that she hears whisper gently to her among the fuzzy electrical whine of white noise. How could she hope to give herself over to someone else when there’s not all of her there to give? Marie and Tomoe die clutching their faces, visages twisted into a horrified scream. Both of their final moments were spent thinking, feeling, being plagued by the concept of a real place. The foggy yellow tendrils reaching out, framing the moon like a lover’s fingers caressing the face of their beloved. In the background, the sea splashes a consistent melody and cadence through the abandoned island, water a tenebrous black-blue like a fresh bruise on the world. It’s Rougetsu Island, that much is absolutely certain. The place from their long-lost childhood, devoured beneath whatever plague the moon had cast upon them that night when it had swallowed all of them whole. Misaki has to go back. She has to go back not just because she wants to know the truth, and not because she hears someone trying to call for her, but because she is missing something, she is missing… someone, and for a moment, her mind wanders back to the conversation just a few weeks prior, but she dismisses it in the same thought. Whatever she’s missing… is not that. It can’t be that. The flood of memories is overwhelming; it’s not a thousand things returning all at once, just a few dozen things trickling, thick and heavy, into the holes in her mind from where her ‘illness’ had left its scars. Nonetheless, it’s not the volume of memories, but the sheer gravity of them that leaves Misaki sobbing, unable to stop. She hears the footsteps, and she barely has time to cant her head up, to look at the figure as it approaches, walking slow and deliberate across the Kiraigou stage, deep in the musty, damp underground cavern. Once upon a time, Misaki would have enthusiastically described her beloved Onee-chan as many things; ‘pretty’, ‘nice’, ‘awesome’, with a sprinkling of very, very -s to amplify the sentiments. Now, she has words above and beyond the vernacular her child self would have been saddled with, and even then, the words fail her as her memories clear, and she can see the face so long obscured beneath the rippling mask of Blooming. She understands why beauty sometimes is described as ‘transcendent’ as her eyes meet the woman’s, rich and bright like molten gold even in the dim lighting of the underground cavern. Misaki suddenly finds it even harder to breathe through the choking sobs. In her soul, a sound unlike any other seeps in like fog in the evening, twines with her own, a peaceful harmony so perfect it’s almost terrifying. It’s so familiar and so right it makes the scene feel whole, makes Misaki feel whole, and the sensation is overwhelming, bringing forth a whole new wave of tears she’s not certain are entirely her own. Arms encircle her, and she hiccups as her heart pounds its way into her throat, but she barely notices it over the veritable flood within her mind. She just wishes that the image was clearer, that the sound was more crisp. The whole thing occasionally shrieks, distorts, like a television receiving a shoddy signal until it blinks out entirely and Misaki falls into nothing. Misaki and Ruka are the only two that escape the island. With their memories intact once more, it almost follows that they should feel more whole, but Misaki feels anything but. The entire ordeal instead gives her a sensation like there’s something missing within her more acutely than before. “Do you believe in love?” Misaki asks, one night long after the experience as she and Ruka sit on the bank of a river beneath a swollen midsummer full moon, the cicadas buzzing their final goodnights around them in a droning refrain. She stares out into the water, watching the ebb and flow ripple the surface, distorting the silvery reflection. It’s so nostalgic, she feels her throat tighten. “My mother said that you’ll know your soulmate because your Lunar Melodies harmonize together,” Ruka says, thoughtfully, as her eyes trace the shadows on the moon’s surface, looking over the patterns, darker gray on the ashen surface, so much colder than what they’re used to. The moon doesn’t have its pull here, its influence, an entire sea away from Rougetsu Island, but they both feel a connection anyway. It’s not the answer Misaki is expecting - if anything, she expected the pensive stare from that night in Ruka’s bedroom so many years ago and nothing more. Misaki glances away from the water’s surface and to the side where Ruka sits, and a moment later, Ruka looks down from the moon and over toward her, meeting her eyes, even and unflinching. Misaki’s tried, in the time since they made their way back from the island, to seek out that feeling she’d had once. She finds someone whose presence she can accept, can bring close to her, but no matter how she tries, it never resonates with her own the right way. The closest she’s found yet is Ruka, but there’s an awareness between the both of them, an understanding of what it is: Ruka is a Tsukimori Miko - it is in their very nature to have a soothing, complementary sound to others, because it is within their very bloodline to calm a raging spirit. Ruka is not what Misaki wants, no matter how good it feels when they’re together. “Some day,” Ruka says, and sounds very sure of it. “If I even want it to,” Misaki retorts, with as much of her usual exasperation as she can force into the phrase, pretending she hadn’t asked such a… a silly question in the first place. “Some day,” Ruka repeats, and Misaki swears she can see a little twinkle in the corner of her green eyes before she turns back to the sky, staring, silently enthralled. A box arrives at Misaki’s doorstep several weeks later. There’s no return address, but all it takes is for Misaki to lean over close enough to it to discern this fact when a familiar sensation, like a gentle caress of fingertips along her back, washes over her, raises goosebumps down her arms. She’s barely within her room before she tears open the packaging. The doll is wrapped in yellowing newspapers dated almost fifteen years ago, but despite the passage of time, the clothes are neat and clean, the hair well-taken care of, and the porcelain skin undamaged. “Miya…” She whispers, an awe-filled hope in the breathless tone of her voice, and she pulls the doll to her chest, buries her nose in the silken hair. Miya smells of dust, but something else, too, faint and unmistakable and like a familiar place where Misaki belongs. Her heart soars, races, leaves her feeling dizzy. She falls asleep with the doll in her arms, and dreams of a beautiful forest, still and quiet but for the rustle of wind and sleepy motions of animals in the underbrush. 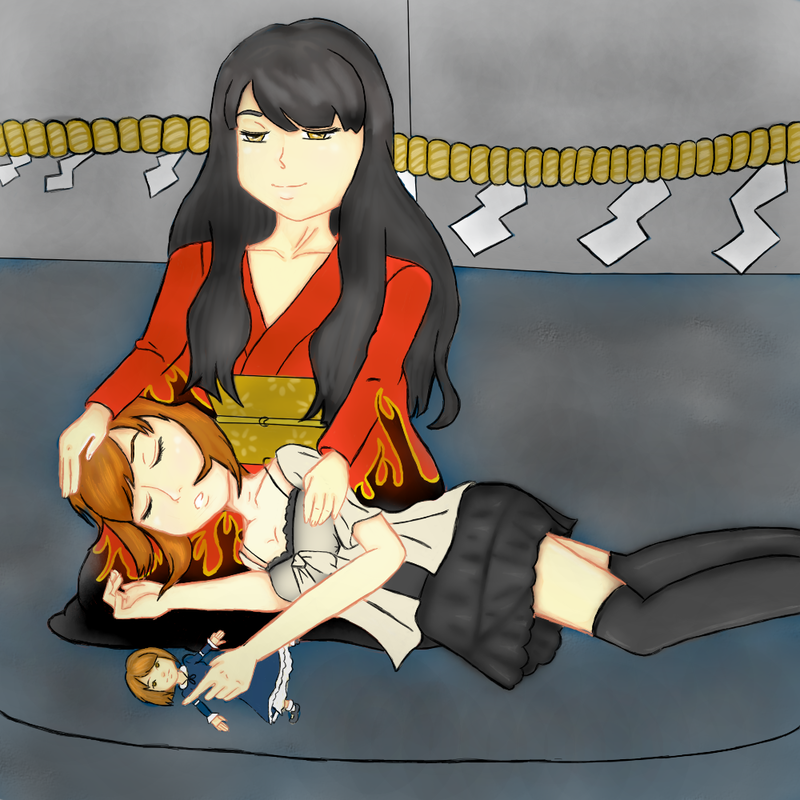 It’s the most peaceful dream Misaki’s had in years. The next morning, she places Miya comfortably in the corner of her bed where it belongs. She wishes she could bring the doll with her everywhere like when she was a child, but if age has done anything, it has given her at least enough pragmatism to know that is not the wisest idea, and she leaves for the day feeling better rested than she has in so long she doesn’t remember. Misaki’s answer comes just a few days later, when she wanders down a long, winding trail off a sidewalk on a whim. She follows the river she and Ruka had sat on the shore of not long ago, footsteps crunching over the dirt, grass, and leaf litter still clinging to the area from the previous autumn. The air is rich with the sound of birds and insects, cloyingly sweet with the scent of late-summer flora. She hears the sea before she comes to it, and the sharp crunch of dirt shifts to the softer scuff of sand and rocks across it as she steps onto the beach. Rougetsu Island is across this sea, she knows, and it would be so easy to take that ferry to return. Further off-shore, she can see the moon reflected on the sea, undisturbed, unmarred, a glimmering gold disc on the water. Around her, the trees and brush quiet with the coming dusk. She feels it first, ‘hears’ it with her sixth sense. It’s a soft sound, a single note at first, long and held, before it shifts into another, and another, crystalline in clarity and perfect in cadence. She feels it blow within her as though carried on the wind from across the sea itself, swirl about, then curl around her own sound, though not so physical as that. It takes but a moment for the two sounds to overlap, to harmonize, to perfect, like the other half of an orchestra sitting down and finally joining the melody. There’s a combination tone within her, a reverberating sound above and below the sounds of her soul, of the approaching figure, of them combined, and rather than turn and greet her companion, Misaki closes her eyes and tilts her head back, and merely listens as the chord is struck. In her mind, she sees the moon, gorgeous pale gold, low in the sky, above a forest at the shore of a sea. The deeper water, undisturbed, perfectly reflects the moon, the trees rustle only faintly in the breeze, the sea waves wash gentle and consistent only upon the shore, providing tempo for the melody. It’s so vivid in her mind, it feels more real than the scene she is actually standing in. She feels as though she is watching herself, where she is at, from someone else across the sea, or perhaps atop the water, looking back. Misaki feels fingertips brush against both cheeks, pushing back until her head is cradled gently between a pair of warm, soft hands. Goosebumps rise along her arms and shoulders at the touch, at the way it amplifies the sound within her, and how good it all feels. There has only been one person in the world that made Misaki feel complete like this. Whole. Like the sound of her soul finally has all the parts and instruments the way it should. It feels so wonderful, she’s not sure how she managed to live without it for so long. She cracks her eyes open just a sliver and finds them met with a honey-gold gaze that she realizes she missed so much it physically hurts. Her heart jumps into her throat, and it takes several moments before she can say anything; she’s dizzy and trembling with the high of just one touch. She knows now what it means. “Do you believe in love?” Misaki asks, unsure if she actually spoke aloud. The sound hits a gentle, slow crescendo in response, until she’s not sure where she ends and the other begins and she leans forward into an embrace like falling. My gift to myself and everyone else who may or may not like my taste in trash ships. I tried my hand at some weird Yuuri/Ouse this year. I hope you'll like it! Merry Christmas! In the photograph, Ouse is smiling. The album is open on Ren's desk, and it's the first thing Yuuri sees, when she goes to put down the pile of reference books she's brought over from the shop. She drops them haphazardly without looking where they fall, and picks up the photo instead. "What's wrong?" Ren asks from the couch, where he's organising folders. "Oh, that. I'm not sure what to do with it. I don't want to put it in the book; it still feels like it's connected to something." "Mm," Yuuri says absently. Just the sight of it makes her feel as if the breath has been knocked out of her. She never saw the cursed version of the picture that Ren told her about, and she wonders what kind of power that must have had, if this is the safe copy. Ouse stares right out at her, smile full of secrets. She looks as if you could touch her and she would feel warm. "Do you want it?" Ren asks, after a moment. He shrugs. "Sure. It's probably better off with you and Hisoka anyway. You can keep an eye on it, make sure she's behaving." Yuuri tries not to be annoyed at his flippancy; she doesn't think he can really be as casual about it as he's pretending to be. He senses its power as well. But she takes the photo. She quickly understands what Ren meant about not knowing what to do with it. First she puts it between the pages of her diary, but it bothers her, somehow, to shut it away in the darkness. She buys a picture frame, but that feels wrong as well - putting this picture up on her shelf like a picture of an ordinary friend or relative. She doesn't even have pictures of her family, and the fact that this would be the first makes her feel oddly self-conscious. Finally, she props it up in the back corner of her desk, in the little cubby under the shelf, so it won't be visible from the door. She keeps imagining what Hisoka will think if she sees it. For the next few days, she makes doubly sure to keep her bed made and her room tidy, so Hisoka won't have any reason to come in. It's not that she means to keep it secret, exactly. It's just that she doesn't want to have to explain, because she doesn't know what she would say. Hisoka might think - Yuuri doesn't know what, exactly. That she's damaged by what happened to her, that she's obsessed? That she's still craving death? There's no reason to keep a picture of a dead woman around, especially not when that picture is still linked to her in some profound way. Yuuri's sure it's not dangerous, but it's definitely a little strange. The truth is, she just likes looking at it, and she doesn't think Hisoka will accept such a simple explanation. So she keeps it to herself, promising that if anything peculiar happens, she'll tell Hisoka everything. In the meantime, it's a pleasure to come back to her room after a long day in the shop, or after they've been out on a job, and find Ouse waiting there for her, quiet and smiling and untouched by the world. It's comforting to look at her face, to trace the point of her chin or the fall of her veil, and know she's still there on the mountain, holding back the black water. At night, even in the darkness, Yuuri can see the pale outline of the photo. It makes her think of Ouse's bridal clothes, shining white in the light of the sunset. Pristine. Beautiful. Her breath catches. For a moment she's afraid. But she turns on the lamp and studies Ouse's smile, and relaxes. It's not a curse, to think she's beautiful. It's not a curse any more. When Yuuri turns twenty she gives up on the diary the doctor assigned her like homework. It never really helped, anyway; it just turned into a habit. When she needs to remind herself about cases, she has the reports she and Hisoka write up, and she's learned much better ways to cope with the occasional incursions of the Netherworld into her life. But it's harder than she'd thought it would be to shake the habit of expressing her feelings somewhere. She ends up talking to Ouse instead. A lot of what Yuuri's going through now, Ouse must have gone through in her day, when she was learning to be a priestess. It's nice to imagine her listening, understanding, offering advice. Trying to think how she might answer gives a distance and objectivity the diary never did. Soon it feels normal to sit at her desk, or on her bed, talking to a photograph. If she closes her eyes, she can imagine Ouse in the room with her. Sometimes the presence is so strong Yuuri jumps out of her chair at the fragrance of lilies, and then laughs at herself afterwards. When she's twenty-one, the picture answers back. But that feels normal, too. Inevitable, even. Yuuri's gotten so good at imagining what it would be like if it happened, she's made herself believe it. And what's the harm? There's nothing wrong with her; she's not like those people who become withdrawn, who only dream of the dead. She works with Hisoka all day long, sees Miu and Ren and Rui all the time; she's even taking part-time courses, hoping to start her own business. Ouse doesn't follow her around all day - she's just there waiting when Yuuri gets home, and her voice, real or imagined, is like a cool shower of rain on a hot night. And if the answers Yuuri hears can be trusted, it comforts Ouse too. She says she likes to know about the world, even if she can never see it. She likes to hear a human voice, in the solitude of the casket. She's glad that it's Yuuri. Hisoka pauses at the top of the stairs outside Yuuri's door, frowning. "I thought I heard voices," she says. It's just ambiguous enough that Yuuri doesn't feel like too much of a liar when she says, "No, just me talking to myself." Sometimes she thinks about that path lined with higanbana, lost in the undergrowth. Miu and Ren told her what was at the end of it, and showed her some blurry photos, but it's not the same as seeing it. She pictures herself walking to the House of Joining, just to make sure she's not finding the idea too appealing. So far, so good. It's just an abstract thought, maybe for the far future. She doesn't want to leave the life she has now. It's taken her this long to stop freeloading off Hisoka, but she finally has a place of her own, and she likes being independent. She goes into the antiques shop as a customer, though the other customers usually don't get hugs, and she and Hisoka still work together on shadow-reading assignments. They've even managed to rope Miu into it once or twice. And when Yuuri gets home, Ouse is there. She really is, Yuuri is almost sure of it. Things move when she's not looking. If she brings the radio into the same room as the photo, it clouds with static, and if she leaves it there, Ouse's voice comes through, as if from far away. Miu and Hisoka have both been to the apartment, and neither of them have said anything, but they don't come often. The cat she tried to adopt huddled in the shoe rack by the entrance and wouldn't come any further inside. She and Ouse don't even talk so much any more, not aloud. They're like an old married couple, comfortable in the silence. It's enough to be aware she's not alone, that someone is out there listening, and she supposes it's the same for Ouse. At night she can see the photo on her bedside table. She still can't bring herself to trap it behind glass in a frame, and she used to worry about it getting creased or stained, but it looks as crisp and white as it did when she first brought it home. She remembers a story she once read about a man who claimed to have married, but no one ever saw his wife, except in a photograph. She can't remember how that story ended now. Badly for everyone, no doubt; that's how those stories always seem to end. People are always quick with dire warnings about things they don't understand. At the edge of sleep comes the familiar scent of lilies, and the whisper of silk, mingling with the sound of flowing water. In the morning she won't be sure it happened at all, but as the dream takes shape around her, Yuuri smiles, and turns, and opens her arms. @Mid: AND YOU. Excellent. I love weird shipping dead and alive people, and this is great. I also love Ouse and Yuuri, so this tickles my other big FF pairing, and I always love the way you write. SO YES I LOVE IT.